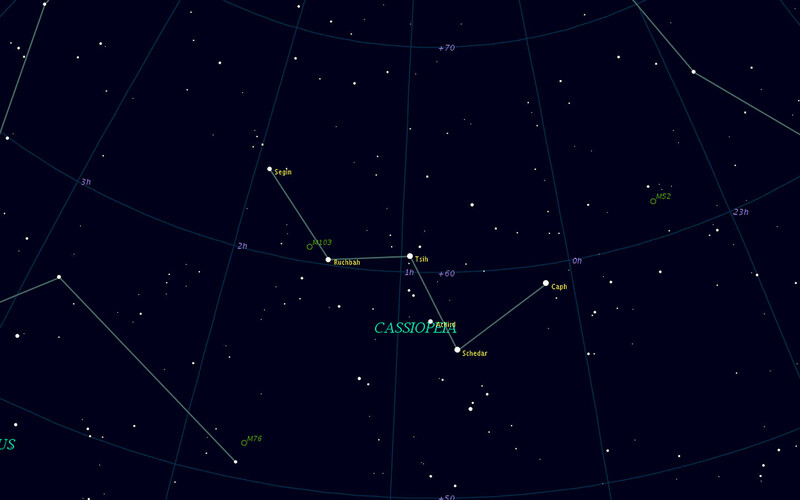 Cassiopeia's faint but unmistakeable "W" which swivels about the North Pole can be visited nearly any month of the year. It's upper culmination occurs in early October. While Cassiopeia hasn't as many objects as its neighbours, it is splendidly-placed to serve as a pointer to other nearby constellations. Alpha Cassiopeiae, "Schedar" (Breast), is a giant yellow star with a wide ninth magnitude companion. To find Cassiopeia first locate the Big Dipper. Now draw a line from the �pointer stars� (beta and alpha UMa) through the Pole Star. Don't stop there, but continue the line to about the same distance on the other side of the Pole Star. You'll encounter a very wide "W" or "M", depending on the time of year. The western tip of the W is beta Cas (also known as Caph). Follow this to the next star on the "W", an equally bright star which is alpha Cassiopeiae (Schedar, The Breast). These two are visible in the same FOV. Note that North is indicated on these charts. Always bear in mind the orientation of circumpolar stars. Eta Cassiopeia is a wonderful double star with a striking colour contrast which seems to depend on the observer. Its primary is yellow (or golden) while the seventh-magnitude companion is red (or perhaps purple?). The companion orbits its primary every 480 years and according to its orbit it is presently at a position angle of 317� and a very wide separation of 13", a separation which is slowly growing even wider. Gamma Cassiopeia is an interesting variable, a shell star which is ejecting rings of gas due to its rapid rotation. The visual magnitude thus varies between about 3.0 to as bright as 1.6, although usually it is around 2.5. The patient observer with binoculars might discover visible differences in its visual magnitude over the course of a single evening. Further to the east of gamma is delta and the Messier object M103, fifty or so stars about 4000 light years away.